Welcome to this slightly Olympic 24th issue of the Bootleggers Buzz! To be quite frank I have to admit that the Olympic vibe can only be caught when looking at the picture that is on top of this Editors Note. Other than this what is now loading, or hopefully has already been loaded, on your screen is a normal issue of the Buzz like the ones you are used to seeing week after week. Having the formalities done I must admit I broke a promise. Last week, I said that the following issue would not have an Editors Note that has been written by me. However, those who are paying attention and are actually reading this (and I sometimes doubt many people do) will notice that it is me again who is publishing the issue and who is responsible for this piece of text. Reason for this being that Poison has decided to leave the Buzz and resign. As hard as it was for him, his real life obligations prevented him from doing the job he wanted to do, and we here at the Buzz can only respect that decision. From the sad news I would like to move on to happier news, as congratulations are in order to two of our writers: ShyGuyII and FlameS. We are happy to announce that they have agreed to become the new editors of the Bootleggers Buzz. As soon as this issue has been released they will start working on the issue for next week and for the many weeks to come after that. I have already heard rumors about a contest, so it should be a grand next issue! No pressure, though. Other than these special announcements which are not covered in any of the articles we have a goodbye article for Poison, so okay that one has actually been covered, and we brief you on the attack on Mafia Animals. FlameS reflects on several ways to advertise the game and has also given us the promised Anonymous Video, which is at part two this week. All our weeklies are also present and we have a Joke of the Week again from Goldhunter to hopefully make a real smile appear via virtual ways. The issue of this week is rather short, I am afraid. However, with two editors I have good hopes that next week's issue will have more reading material for you. That was it for me. Until next time! Early on Wednesday morning we received reports that the Mafia Animals had suffered the ultimate punishment: the feared crew wipe. Check inside to see the second part of our anonymous video! 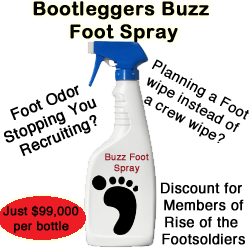 I write this article knowing that I am the next Editor (co) of the Bootleggers Buzz. This in itself makes me feel extremely proud, but also gives me a chance to do something I have a real passion for online. Two days ago Poison announced that he has resigned as Buzz Editor and Help Desk Operator. A great leader and a great friend, we will definitely miss you Poison! The obituaries for this week. Man: Darling! If I would win the lottery what would you do? Wife: Take half and leave you! Man: Oh thats awesome! I just won 12 dollar, Here take 6 and GET OFF!